Dramedy is a blend of drama and comedy. It may seem like a combination that doesn't work - cannot work - but when done well, it can be very effective. Powerful, even. This week's Drama Newsletter, then, is all about facing the dark with a smile on your face. I’ll admit it – I like a good dramedy. The blend of comedy elements with drama, if done well, can strengthen a piece, whether it’s a story, a novel, a movie or a TV show. Pure drama can drain the reader or viewer. Some smiles, or moments of laughter, can lift the mood, carry the audience forward. Of course, they can also strengthen the impact of what is to come. Meteor Garden is the kind of series that makes you laugh one moment and cry the next. The interactions between the guys and Dao Ming Si’s complete ignorance about dating and romance bring a touch of light to a series which, at times, is filled with heartbreak and struggle. It took a few episodes for me to get into the story, and I wasn’t too happy with the final two episodes, but on the whole it captivated me. Another series that balances humor with drama very well is Love O2O, another Chinese production. If you enjoy gaming, you might be interested in this series as it is partly set in a gaming world, from which stem some very beautiful scenes but also touches of humour which gamers will easily recognise. But one does not need to write a full-on dramedy to add touches of humour to a tale. Many people are, right now, awaiting the final season of Game of Thrones. Game of Thrones is not a dramedy, but there are places in the series that raise a smile or chuckle. The same goes for the books the series is based on – George R. R. Martin’s A Song of Ice and Fire. The wit of Tyrion, his and Brienne’s interactions with Pod, Arya and the Hound (at times), all can offer some light relief amongst the darkness, however brief. It’s welcome and necessary. Game of Thrones isn’t a pleasant tale. Captivating, but not pleasant. The lighter moments help the reader/viewer make it through. They also make the characters more relatable, more human. Well-placed comedy is a skill that’s good to develop for any writer. You don’t have to go for laugh-out-loud moments. Nor should humour be inserted into a tale just because. It has to fit the story, and the characters. Smiles can be raised through wit, as with Tyrion, or sarcasm, or cunning. It can be clever. It can be present in a single, well-constructed phrase. It’s up to you how you use it, and where. Done well, your audience will appreciate it. Of course, that is easier said than done. Comedy may seem simple, but it’s not. I personally find it rather difficult. I know what I like in other works, but adding it to my own is never straightforward. Perhaps I do not have the talent, nor the experience. It may be easier for you. I guess that for many of us, though, it takes practice, just like any other part of writing. Practice, and feedback. There are comedy contests on the site that you can enter, and if you put something out there, reviewers will let you know what they think. You can develop your skills from there, keeping in mind that humour is subjective – what strikes a chord with one person may leave another cold. And that may make it more complicated, but once there’s a general consensus, you’ll know that you’re on the right track. Above all, as always, enjoy yourself! That’s what writing’s all about. Write me a story or poem in the equivalent space of an 'old-school' tweet-140 characters. Think you can write a contest winning poem in 24 hours? Back for April only! 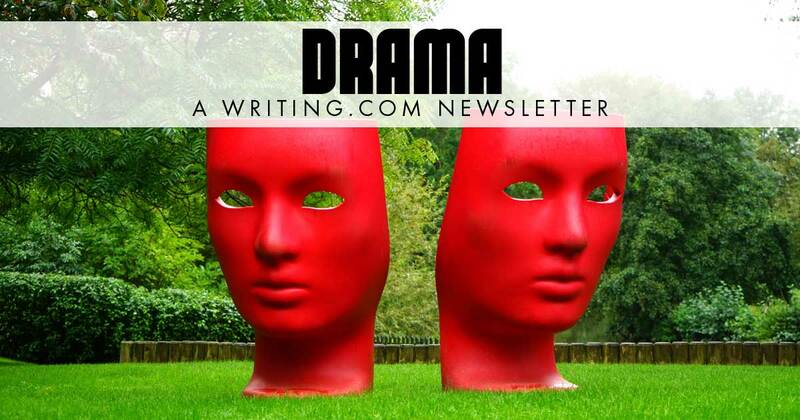 The Drama Newsletter Team welcomes any and all questions, suggestions, thoughts and feedback, so please don't hesitate to write in! Generated in 1.29 seconds at 12:11am on Apr 24, 2019 via server WWW1.